The Dogançay Museum, Turkey’s first modern art museum, officially opened its doors to the public in 2004. Dogancay Museum is housed in a historic 150-year-old five-story building located in the heart of the bustling Beyoğlu district of Istanbul. It provides a general overview of a small portion of the prolific oeuvre of Burhan Dogançay, one of Turkey’s leading artists. This mini-retrospective spans five decades of Dogançay’s artistic evolution, starting with his early figurative paintings up to his wall-inspired works as well as photographs. 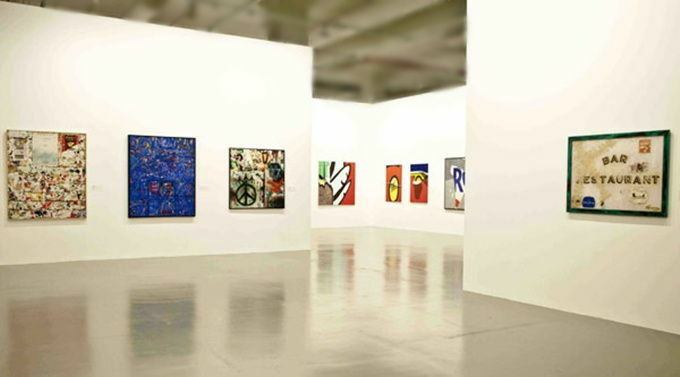 One room of the museum showcases the work of his father, Adil Dogançay. Since 2005, the Dogançay Museum, in cooperation with the Greater Istanbul Municipality and corporate sponsors, has organized and presented a juried elementary school art competition. Each year, an average of 7,000 students between the ages of eight and fourteen, from 1,500 schools, submit their applications for this event. First place prizes have included a four-day trip to Paris in 2006 and a one-week trip to London in 2007. The Dogançay Museum is committed to continuing this annual competition, the goal of which is to promote education through art. Who is Adil & Burhan Dogançay? Adil Dogançay was born in Istanbul in 1900. An officer in the Turkish army, he was also a well-known painter. His works are predominantly impressionistic land and seascapes and still lifes in oil on canvas. Few of his paintings are dated; most of those on display in the museum were completed between 1940 and 1990, the year he died. As a topographer in the army, Adil traveled all over Anatolia, which gave him the opportunity to spend hours surrounded by nature. He produced most of his paintings outdoors, calling nature his “greatest teacher”. Well-known painter Arif Kaptan, and Adil Dogançay, the father of Burhan Dogançay provided Burhan Dogançay’s early artistic training. During the early 1950s. Dogançay spent a significant part of his student years in Paris studying art at the Academie de la Grande Chaumiere while simultaneously pursuing his studies in law and economics at the University of Paris. During this period he continued to paint regularly and to show his works in several group exhibitions, including joint exhibitions with his father at the Ankara Art Lovers Club. Following a brief career in the diplomatic service which brought him to New York City (a lovely destination after your trip to Istanbul! ) in 1962. Dogançay decided in 1964 to devote himself entirely to art and to make New York his permanent home. Since the opening of his museum, however, he has been dividing his time between New York, Istanbul, and the south of Turkey where he also maintains a studio in Turgutreis. Burhan Dogançay is primarily known for a body of work that grew out of his fascination with urban walls. Spanning a period of almost fifty years, this preoccupation was inspired by his travels to more than 100 countries and has been consistently translated into paintings, graphics, Aubusson tapestries, sculptures and photographs. While urban walls are the recurring theme, the different styles in which they are rendered vary greatly. Dogançay re-creates walls in different series, relating to doors, colors, graffiti-types or the objects which he incorporates in his works. With posters and objects gathered from walls forming the main ingredient for his work, it is only logical that Dogançay’s preferred medium has been predominantly ‘collage’ and to some extent ‘fumage’. In the 70s and 80s he gained notoriety with his interpretation of urban walls in his signature ribbons series, which in contrast to his collaged billboard works consist of clean paper strips and their calligraphically-shaped shadows. This series, which grew out of three-dimensional maquettes, later gave rise to alucobond-aluminum shadow sculptures. His collage and fumage works from the cones series form another easily recognizable style.